Celox will be heading to Dubai to exhibit at the Middle East’s largest healthcare exhibition, Arab Health 2018. The largest gathering of healthcare and trade professionals in the MENA region, Arab Health 2018 is expected to welcome more than 4,200 exhibiting companies and 103,000 attendees from 150+ countries and is hosted at the Dubai International Convention & Exhibition Centre. 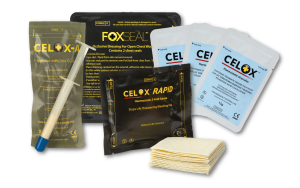 Celox will be exhibiting in the UK pavilion, Hall 7 at Arab Health 2018. Located within the Association of British Healthcare Industries (ABHI) stand. Our Pod will be showcasing our latest haemorrhage control packing trainers, Celox haemostatic devices, Foxseal chest seals and Silvapro Antibacterial burn dressings. The UK Pavilion is the third largest Pavilion at Arab Health with over 160 UK exhibitors expected. Dubai International Convention & Exhibition Centre 29 January – 01 February 2018. ABHI is the UK’s lead medical technology trade association. With a community of over 260 members, ABHI champion the use of safe and effective medical technologies to support high quality patient outcomes and health system efficiency. Members include leading multinationals through to small and medium sized enterprises. ABHI represent the industry to key stakeholders, such as the Government, NHS and regulators. ABHI’s work focuses on UK market, ethics and compliance, international business development and the regulation of medical devices.